Thinking about giving your dated kitchen a new appearance? Fortunately, there is a cost-effective alternative to replacing your cabinets completely—you can reface them. Refacing is a quick and relatively inexpensive way to achieve a refreshed aesthetic with minimal disruption to your kitchen and daily life. As part of a refacing project, the cabinet boxes and frames are usually kept, while the cabinet doors and drawer fronts are replaced. (The size and layout of your cabinets remains unchanged.) Assuming your cabinet boxes are are in good condition, the next step is to decide on the look you wish them to have. Painting the boxes is one option. If, however, you desire traditional stained wood or a smooth, glossy, and modern finish, a veneer layer will need to be added. Veneers are available factory-finished or unfinished, the latter of which may be stained. Note: Applying the veneer requires care and precision. Prefinished veneers are difficult to touch up, even if you make a minor mistake during installation. Unfinished veneers are very thin but can be touched up more easily. Standard cabinet door styles and sizes will be appropriate for most cabinet openings, and the same is true of cabinet drawer fronts. 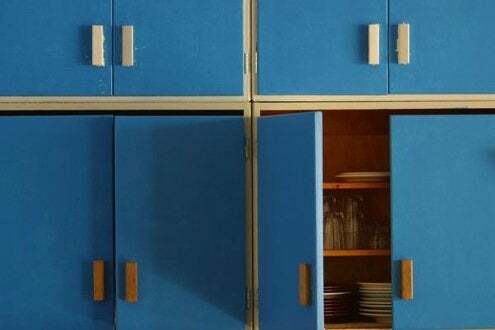 To reface older or custom cabinets whose dimensions are not standard, you can always opt to have specially sized doors or drawer fronts manufactured, but doing so can significantly cut into any savings you gain by choosing to reface. Like veneer, cabinets doors and drawer fronts are available unfinished (which you can paint or stain) or prefinished. Given the wide selection available, it should be easy to find a standard factory finish to your liking. When shopping for new cabinet doors and drawer fronts, accurate measurements are of the utmost importance, particularly when purchasing online. To minimize error, provide your cabinetmaker with an old door and drawer front in each size that you will need. New hardware is an important part of refacing. If possible, coordinate your choice of knobs or pulls with the hinges of your cabinet doors. Remember that, because re-hanging cabinet doors can be tricky, the smart move is to use adjustable hinges, which allow for adjustments and fine-tuning to be done with a screwdriver. Refacing cabinets with new doors and drawer fronts is a straightforward project for the experienced do-it-yourselfer. But even if you decide to hire a contractor, the cost remains significantly less than a complete kitchen cabinet replacement. Most impressive of all is the fact that you can have a new kitchen within the space of only one or two weekends.